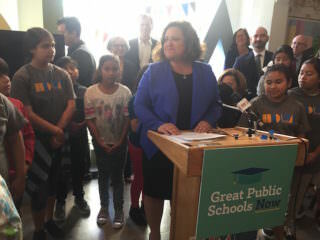 Great Public Schools Now’s executive director, Myrna Castrejon, announces the first grants at a news conference last Thursday. More than once in California, it has taken a major lawsuit to try to propel long-awaited change for its schools. In 1999, the State Allocation Board was sued because of overcrowding in Los Angeles public schools. Last year, a coalition of groups brought a lawsuit accusing the Los Angeles Unified School District (LAUSD) of diverting money away from low-income, foster children, and English-language learners. So it’s a welcome development when instead of looking to the court system to improve schools, educational inequities can be addressed through partnerships among schools, nonprofits and philanthropies. Great Public Schools Now (GPSN), a nonprofit organization in Los Angeles, is awarding grants to successful programs and schools—be they traditional public schools, charter schools or magnet—to replicate or expand their efforts to improve schools for 160,000 students in 10 low-income Los Angeles neighborhoods. On Thursday GPSN announced its first three grants—$2 million for Teach For America to focus on training more special education teachers for traditional schools, $2 million for Equitas Charter Network to build a school and expand its new K-4 campus, and $500,000 for new space for an after school program run by Heart of Los Angeles (HOLA). The fact that Great Public Schools Now is open to supporting any type of high-achieving program (and not just charter schools) is a refreshing development in a city whose school board has been hostile to the expansion of charters. For parents who reside in the low-income neighborhoods GPSN will focus on, they say it’s time for the conflict between traditional public schools and charter schools to end. Mary Najera, community liaison for Extera Public Schools and a veteran parent organizer who lives in the Boyle Heights neighborhood of Los Angeles, said she was excited by the collaborative nature of Great Public Schools Now. As a former LAUSD biology teacher, Avalos said the most promising part of the plan was its emphasis on teachers’ professional development. She said that it was a misconception that struggling neighborhoods don’t have any talented educators. Like so many urban districts, Los Angeles schools suffer a dearth of quality and money. Great Public Schools Now is not putting a cap on how much money it will award or how many organizations will win grants. Not many cities have received such a boon. That’s belated news for parents like Avalos who experienced years of frustration before finding the right schools for her children—and then had to fight for these schools to remain open. “Once you know what quality is, you never go back to mediocre,” she said. Teach For America Los Angeles will receive $2 million to train and develop new corps members and alumni. The organization will increase its crop of teachers from 80 to 130 teachers next year. Out of this number, between 45 and 50 members will be placed as special education teachers in traditional public schools and their affiliates.“Given the current talent shortage I knew we would need to increase the number of new teachers joining our Los Angeles corps…This support will allow Teach For America to have a greater presence and impact across the highest-need public schools – with a focus on traditional LAUSD schools – in Los Angeles,” Lida Jennings, executive director of Teacher For America Los Angeles, said in a statement. Equitas, founded in 2009 in the Pico-Union neighborhood, got $2 million for a new building for Equitas Academy #3. Malka Borrego, Equitas’ founder and chief executive, says her network has a waitlist of more than 1,000 families. Through the funding, Equitas Academy 3 will be able to expand from 100 kindergarten students to 500 in grades K to 8.“Our families want access to schools. We’re trying to unite Los Angeles and develop strong schools,” said Borrego, a third-generation resident of the neighborhood. Caroline Bermudez is senior writer at Education Post. Before that she was a staff editor at The Chronicle of Philanthropy, covering the nonprofit world, with a particular focus on foundations and high net-worth giving.